At Naturacamp Travels, we have put together tour packages for Nagaland and Manipur so that you can get a thorough glimpse of the beauty these two North-eastern states offers. The breathtaking sights that await you will make for quite an unforgettable experience. The people, places, and the flavours of these two states will leave you wanting for more. Two of the 'Seven Sister States', you will have a lovely time when you go for a tour of these places. The elevated heights, friendly people and the pleasant weather ensure that you never forget the experience that you have while you visit the states of Nagaland and Manipur. Kohima – The Captial of Nagaland in every sense of the word, there are quite a few beautiful places to see in Kohima, including Shilloi Lake, Japfu Peak and the State Museum. 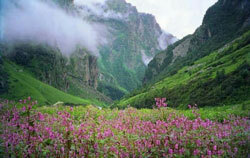 Phek – One of the lesser-known destinations of Nagaland, Phek offers scenic sights of forests and hills. The Zanibu Peak, Pfutsero and Dzudu Lake are some of the places you can visit. Imphal – When it comes to being the capital of Manipur, you can rest assured that you would be spoiled for choosing what to see and what to leave out. Make sure that the Loktak Lake is not something you miss. While you can choose to visit Nagaland and Manipur at any point of time during the year except the monsoons (June to early September), the best time to visit would be in late November, as that is the time when there are native festivals galore. The monsoons are marked with heavy rains that make sightseeing difficult. Day - 1 : DIMAPUR – KOHIMA: Welcome on reach in Dimapur Airport, Nagaland’s one and only Airport that connects with Delhi, Guwahati and Kolkata. Continue to Kohima and check in to the Hotel. At the Evening, visit local market where you can be presented to the Naga foods stuffs like vegetables and fishes. Overnight stay in Kohima. Day - 2 : KOHIMA: After doing the breakfast, you enjoy full day sightseeing the War Cemetery and surrounding areas, the Sale Emporium, Kohima Village and the church. After doing the lunch, visit Jakhama village to discover real Angami Naga tribal. Overnight in Kohima. Day - 3 : DAY EXCURSION TO TOUPHEMA OR KHONOMA: After breakfast, visit Khonoma or Touphema village. Drive to Touphema village Take a walk in an Naga tribal village, museum and also visit the Touphema Village Resort run by the local Angami tribe. Overnight at Kohima. Day - 4 : KOHIMA – IMPHAL: After breakfast, drive to the capital of Manipur, Imphal. Visit Manipur State Museum and Shri Govindajee Temple. Evening free at relaxation to visit the Khwairamband Bazaar (a local market run by mothers). Overnight in Imphal. Day - 5 : IMPHAL: On Day 5, after breakfast, tour the city covering Khonghampat rchidarium and Zoological Garden. Later that drive to Moirang, the ancient capital of the Manipuri Kings. See the Sadu Chiru waterfall and the Japanese war memorial, that reflects the history of the Second World War. Visit the Keibul Lamjao National Park. Return to Imphal. Overnight in Imphal. Day - 6 : IMPHAL AIRPORT DEPARTURE: After breakfast, transfer to Imphal airport for onward journey. Tour Ends Here. Pick up from Imphal Airport and transfer to Hotel. Visit the city by walk and night stay at Imphal. Transfer to Loktak Lake, its fresh water lake. It takes 1 hour drive from Imphal. Night stay at Loktak lake. After breakfast transfer to Imphal, small sightseeing at Imphal, visit Kangla Fort, Govindajee temple, Imphal museum etc. and night stay at Imphal. Visit Myanmar Border town Moreh (4 hours journey from Imphal). Night stay at Moreh. Back to Imphal and night stay. Day visit at Ukhrul, beautiful hill town of Manipur, full day enjoy beauty of Ukhrul. Night stay at Imphal. Transfer to Airport, Tour end. As you can see, not only do we make sure that you get to see all the best places in Nagaland and Manipur, but also have the best possible experience.